This entry was posted in Just Rambling and tagged glitch, hardware failure, maintenance, PCB, repair, soldering. Bookmark the permalink. First is the electrolytic capacitor. Traditionally, these have been used anywhere large amounts of bulk capacitance are needed, for filtering power supplies most often. They are constructed as a metal can filled with an electrolyte and two foils, usually aluminum, that make up the capacitor plates. One of the foils is generally anodized to produce an insulating oxide layer, though nonpolar types with both foils insulated exist as well. These capacitors have the highest density of all the types, but they suffer from failure due to electrolyte evaporation, and sometimes oxide failures. They also do not have very accurate capacitance (a typical tolerance range for electrolytics is +80/-20%, though you can find +/-20%). The lifetime of these caps is highly dependent on temperature, since higher temps can cause the electrolyte to evaporate faster. Electrolytic capacitors used in linear power supplies (those operating in purely DC circuits, or in simple transformer+rectifier supplies) rarely fail in my experience, since they tend not to get very hot. There are exceptions to this, as poorly designed linear power supplies may place electrolytic capacitors near regulators that get hot, causing the capacitor to be at an elevated temperature, thus shortening it’s life. On the other hand, electrolytic capacitors used in switch-mode power supplies (SMPS) operate at very high frequencies and take considerable amounts of ripple current. Every capacitor has an intrinsic loss, and this is often expressed as an ESR. Power dissipated in a capacitor can be expressed as I^2*R, where I is the ripple current in Amps RMS, and R is the ESR. With higher ripple currents, the loss in the capacitor itself can become significant, and cause self heating of the capacitor. For use in SMPS, special low-ESR capacitor types have become popular in the past few decades to reduce this loss and allow capacitors to take more ripple current without shortening the life of the capacitor. However, many of the cheaper brands of caps, most notably those coming from east asian manufacturers, have historically had problems in this regard. There was a period in the late 90’s to early 2000’s known as the capacitor ‘plague’ where many manufacturers went with cheap low ESR capacitors from these manufacturers, only to find many power supplies were failing prematurely (within a year or two of manufacture). Tantalum capacitors can be a variety of colors, but they are always a leaded part (as in, they have leads that extend out from the capacitor, unlike surface mount ceramics, for example). They will look kind of like a drop of material on the end of 2 leads, in thru-hole varieties, and can look like a rectangular cap, with two leads out of the ends in the surface mount variety. Tantalum capacitors, like most electrolytics, are polarized capacitors. Tantalums are also generally used where bulk capacitance is needed for power supply filtering, but they don’t get nearly as large as electrolytics, and they aren’t quite as dense. They do have certain desirable characteristics, like lower ESR than electrolytics, which can be advantageous in certain applications. Failure modes for tantalum capacitors is a bit more interesting, because they often fail as a short circuit, and they seem to fail for no apparent reason very often. Sometimes power supplies will protect themselves into a direct short, and nothing will happen other than the power supply failing to start. Other times, the power supply will kick on as normal, and deliver significant power into the shorted tantalum capacitor. In this case, the results are much more spectacular, with the tantalum capacitor often literally catching on fire and blowing up. If you suspect there is a shorted tantalum cap on a board, and you’re not sure which one it is, a good way to narrow it down is to apply a controlled amount of current from a lab power supply in constant current mode, and find the hot component. Just watch out for excessively hot components, which may burn you (or in the case of the tantalum capacitors, start on fire). Ceramic capacitors are generally a disk-type in thru-hole versions, and a small rectangular device in surface mount types. Ceramic capacitors have better characteristics than most other capacitors, but they are not nearly as capacitively dense as electrolytics or tantalum capacitors. They can be made with fairly precise capacitance values, although there are a wide variety of ceramic capacitors with different dielectric types that have vastly differing characteristics. The other type, are used where the design calls for something more linear, or with higher accuracy, or with better temperature coefficient. As far as failure of these capacitors, ceramics do not generally fail on their own. However, surface mount parts are prone to cracking in environments with high vibration or shock. To remedy this, they make special ‘soft termination’ capacitors that are less susceptible to this issue, but tend to cost more. When ceramic capacitors crack, they can short out. I have seen designs where two ceramic capacitors are placed in series, at right angles to eachother on a board, to reduce the likelihood of *both* ceramics cracking, and shorting out a power rail. Moving on to film capacitors, these capacitors generally have the same advantages as ceramic capacitors. Again, there are a wide variety of dielectrics used in film capacitors, ranging from simple paper, to various polymers such as polyethylene, polypropylene, and even teflon/PTFE for certain special applications. As far as failure modes, these capacitors are generally fairly stable. However, as expected, if the capacitor is mistreated, they can suffer drift in capacitance, or even short circuiting if exposed to bad enough transients. A notable capacitor, are the Rifa safety capacitors made from a paper dielectric. These are common to find in X1/X2/Y cap applications, where the capacitors will be connected across line voltages. These capacitors are encased in an epoxy potting material, and the thermal expansion coefficients of the epoxy is not matched well, apparently, to the other capacitor components. Over the years, the capacitor will begin to crack, and eventually the capacitor will fail short, across the line, and release a large cloud of smoke. These capacitors, luckily, are not usually critical to the power supply, and can be removed without affecting function of the equipment. They are only there to provide some EMI isolation to prevent noise from the equipment from making it back into the power grid, or vice versa. Hopefully I have managed to teach a bit about the different common capacitor types, and give a new perspective on likely failures and some troubleshooting tips. I’ve rarely seen capacitors in linear PSUs and generally low stress environments fail. On the other hand, I’ve seen plenty of failed capacitors in SMPS, and I’ve seen and heard about failures in CRTs, particularly the high frequency/high current deflection circuitry capacitors. That said, I’d also like to note that there are certain capacitors that just seem to spring leaks, and the electrolyte can be corrosive to the board. I have seen that as well, but didn’t think of it when writing the posts. Leaking caps need to get replaced soon, and the board needs to be cleaned to prevent further damage. Same goes for old batteries, like the small ni-cads that were common for keeping RTCs and SRAMs alive in various systems. Wax paper capacitors in tube-era equipment are well known points of failure. These tend to allow moisture into the caps, and they will eventually suffer dielectric breakdown, causing the paper to become carbonized, and thus conductive. Once that happens, the rest of the cap will quickly go, possibly shorting out a supply rail. As these old tube electronics often have near-impossible to replace transformers, this is really another risk you shouldn’t take. Replace the old wax-and-paper caps ASAP, they’re just a ticking time bomb these days. The former are guaranteed to leak and damage your board. The latter are guaranteed go up in smoke 0 to 60 minutes after power-up. The rest seem to depend on how the machine has been stored/used and how it *will be* stored / used. I, personally, don’t mind opening a machine every year or two to check for leakage, but some folks never will. If I’m repairing or restoring a machine for sale, I’m likely to replace some caps “preemptively” because I assume the owner is unlikely to ever check for leakage. Some re-cap situations are a balancing act between possible damage from failed caps vs. possible damage from the replacement job. On machines with poor quality PCBs (Atari XEs, for example), you’re more likely to get damage from the re-work than from the caps since those boards are known to lose pads easily but not well known (to me, at least) for suffering cap damage often. If your soldering skills (or tools) are basic or mediocre, I would not recommend re-working boards like these. And don’t use a “re-cap” project as your first soldering practice. Finally, I’ve seen some anecdotal evidence that heat or humidity is a factor in electrolytic cap failure modes. I’ve wrenched on maybe 8 or so Tandy 100 portables, and only seen 1 with damage from leaking caps. That machine had a label on the bottom indicating it was sold at a store in south Florida, meaning plenty of heat/humidity. YMMV. I am part of various Facebook groups related to old machines and in the Amiga world, they go crazy about recapping everything preventively, not so much in the Atari or Apple groups. So were the caps really that bad in Amigas or is it more of a “cultural” thing? I hear the Amiga 1200 and 600 and maybe 4000 are crazy prone to cap failures. Not so with 1000, 2000. Not sure why. But I’ve seen this. My 34 year old A1000 and the A2000 run great without issue. Where did you hear this? I’ve ran 500s and 1200s (and the 600 is in many ways the same build as the 1200) for god knows how many years, and not once, ever, did I experience or hear about a cap problem on any of them or their PSUs. Mnem comments down lower about the A1200 and 600. He echoes what I have heard in forums re: these Amiga models. Scroll down and have a look. I’ve personally experienced Rifa paper dielectric caps going up in smoke. It’s pretty spectacular. Every single one I’ve seen in vintage computers has shown the case cracking which I suspect is what leads to catastrophic failure, after it lets atmospheric moisture get into the paper dielectric. I replace every one of them on sight, before first power-up, with a poly film safety-rated capacitor with equivalent ratings. They are very commonly found in switching power supplies used in lots of computers from the 1970s and 1980s, from home 8-bit machines to minicomputers. I replace them as a preventative measure because they can physically damage components around them when they inevitably cook off. I only replace other capacitors after they have failed. There are rare cases where I’ve had to do a full re-cap, such as in my Macintosh IIci. It’s much more common in my experience that most or all of the capacitors in my old gear are still doing their jobs. The reasons for the “capacitor plague” have been very well researched. It basically happened, when a company stole the chemical formula for the electrolyte; only that they missed a key ingredient. Thus, only capacitors from a certain time period are affected, because only those contain the tainted electrolyte. 1980s vintage computers are not affected. I had experience of more than 30 years in repairing electronics. We have one client using old “Fr.Hesser” AWD-1 powder filling machine built in 1970, working 24/7 since than. It’s check-weighing controller uses original Siemens electrolyte caps even today. Linear power supply, pcb, transistorized, not much heating, but there are many timing circuits also with elcos. Almost all caps are still good. No ripple on dc rail. I measured ESR of some of them which I replaced just as a precaution, and couldn’t believe, they are still low-esr value. Probably the new, smaller, 105°C elco, put as a replacement is not better than old one. I have many other examples of proffesional industrial and measuring equipment from 80’s and 90’s where elcos are durable. So conclusion is that today elcos for consumer and low end industrial products are deliberately not built to last. I can just confirm it from practice, simultaneously repairing older and newer electronics. Small note re: tantalum capacitors, there are a lot of surface-mount tantalum capacitors made by a number of different manufacturers. They’re usually in yellow or black plastic packaging with a polarity marker. As mentioned in a comment above, in some vintage computing groups it’s “en vogue” to preventively replace all capacitors. This goes to the extreme that newbies are told off for turning their vintage computers on without replacing all caps beforehand. I find this ridiculous! First, spectacular capacitor failure is quite rare (apart from some special cases such as the Rifa capacitors also already mentioned above). Second, one has to make a risk vs. benefit analysis, as written by Josh. I’ve seen more mainboards destroyed by people with subpar soldering skills who were told that they absolutely have to replace all capacitors than I’ve seen mainboards damaged by capacitor failure. Third, not only caps age, so why the focus on these? There’s no hype about replacing, let’s say, worn-down transistors. To summarize: Keep using your computers without worrying to much unless you have a clear indication that a particular component needs to be swapped. After a recent problem with failures of electrolytics, after a overhaul that included changing all electrolytics, the problem was tracked to stock storage. The manufactures specify a 2 year shelf life, but advised this could be extended by regularly charging the capacitors. So I would expect no problems with old systems that are regularly powered on. I had heard that the cap electrolyte recipe theft story was actually a cover for a major supplier screwup, so as not to damage their rep.
Only probs i have had was with elcaps failing on 90’s vintage boards, even a Gigabyte and other major suppliers. These also had major input and firmware probs with the USB 1.2? stack hosing cross bus traffic, so not a huge loss. My old Insight ran till i retired it. I used to earn a lot of pocket money fixing the bad cap in BBC model B power supplies (note to power supply designers, don’t exceed the voltage rating). The classic symptom was taking a very long time to power up, so many were left on all the time and then wouldn’t power up at all after a power cut. I’ve recently had a batch of Honda Beat (Japanese Kei car) ECUs on the bench. They’re well known for cap failure as they sit on the firewall behind the passenger seat and get gradually cooked by the engine. They often leak electrolyte, which can cause extensive corrosion and dissolved traces. Adrian from Adrian’s Digital Basement here — and I now have upwards of 70 vintage systems, many of which needed lots of board repair when I got them. When I look at a system, I will judge its age and the quality of the caps installed. If it’s an 80s system or earlier, I never proactively change the caps. I do not change them during troubleshooting. I ignore everyone’s “advice” that I should always change them. I came to this decision early on when I did remove caps only to test them and find they were absolutely perfect. If I come across one that is leaking and/or bulged, sure I’ll change that one… but for me on all these systems, it just hasn’t happened yet. Even my “Field Found C64” is still sporting all its original electrolytic caps after being outside directly exposed to weather for 20 years. Other types of caps it can be a different story: Those filter caps on the power supplies across the mains input — yeah, those paper caps crack and pop with horrible smoke. (RIFA brand particularly.) I’ll proactively change those or just remove them. Popping or shorted tantalum caps — those happen too. Blown tantalum caps can possibly cause some instability since they essentially go open once they blow — but there are telltale signs of their failure. (Look for pin-point burn marks.) Also, check out EEVBlog’s video on removing all bypass caps and how it doesn’t always cause a problem. Just because later cheaply made electrolytics are a plague to electronics, it doesn’t mean the stuff from the 70s and 80s are problematic and unreliable. most of the capacitor failure I’ve experienced have been in early to mid 2000s machines, they tend to have very obvious bulging when they fail. 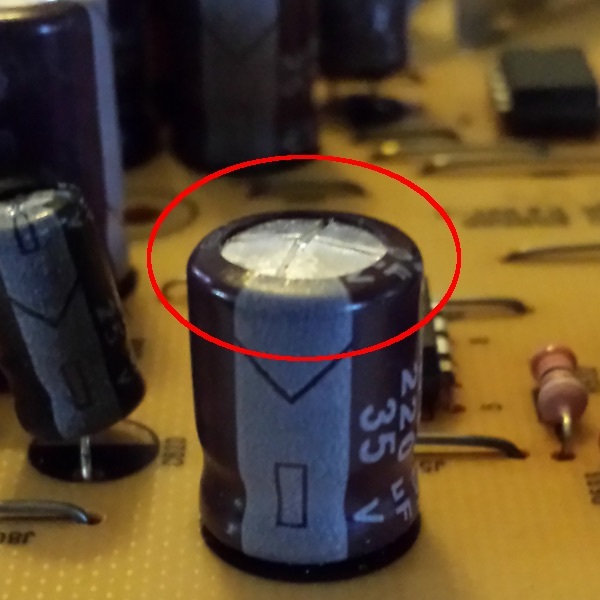 Lately I’ve been tracking down troublesome capacitors in the vertical deflection circuit of a mid-80s 14″ CRT I own, visually they look ok and the symptoms appear to be a loose connection. However their pins were not loose, the solder joint was good and I found pressing on these capacitors would temporarily restore the picture. I also have an older model atari 2600 that may have suffered from capacitor leakage, I haven’t verified that. The problem with the Amiga 600 and 1200 are specifically the surface mount electrolytics. They leak, sometimes invisibly under the package, and eat the board traces. They absolutely should be replaced, if they aren’t leaking yet it’s only a matter of time. Earlier Amigas don’t use these caps and likely won’t ever have a problem outside of failed power supplies. This is basically what I have heard in the forums over at amiga.org, amigaworld.net — people getting 600/1200s on eBay and needing to do cap work, and people offering recap services for the 600/1200s specifically, as opposed to billing the service as something for all Amigas (not that there aren’t occasions where an A500/2000 will have caps failures). It’s been quite a while since I owned my last A1200, but observing from a distance, that seems to be the case. I’m into vintage computing myself but not in a very structured way. I also work in a company that is a service center for a major manufacturer of IT/electronics products. That said, I’ve some personal experiences to add to the excellent explanation by Joe Zatarski. Re. electrolytics, besides the obvious design issues (temperature, ripple above nominal voltage) we encountered, around the late 2000s – early 2010s, quite a lot of monitor power supply boards with capacitors going bad even though the boards were sitting in storage, never powered on. By going bad I mean obvious bulges although I don’t recall any electrolyte release. That is in addition to warranty returns, of course. I’ve also seen my share of bad capacitors on all kinds of computer mainboards and power supplies starting just after the Pentium II era. Oh and regarding linear power supplies: some old network switches with unregulated (trafo, bridge rectifier, capacitor) “power bricks” had this problem (cap going bad inside the power brick) but that might have been thermal issue, coupled with long (>5 years continuous) power on time. Re. the infamous 68k Macs, I’ve had one Mac Classic with this exact same problem, and also a friend working in a another service shop told me he was replacing hundreds of small 1uF capacitors in camcorders in the late 1990s – early 2000s. In older equipment.. not that much. I’ve always been somewhat apprehensive about electrolytics in older computers (1980-1990) but even 30 years later, capacitors in their SMPS measure good both in capacity and ESR (maybe 10-20% under nominal capacity but generaly not worse than that). Under the circumstances that’s not bad (especially compared with the “disasters” that I see in modern SMPSs). However, there is something else that might prove to be a problem for equipment from that era and that is smaller (in both size and capacity) decoupling capacitors with rubber seals. I’ve seen enough of these leaking electrolyte and that electrolyte can cause all kinds of troubles (being both corrosive and electrically conductive). I think another advantage with older (’80s-’90s) SMPSs is that they are quite underpowered for their size, maybe they also use lower frequencies, perhaps slower switching times (haven’t checked, it’s just a thought). With tantalum capacitors I’ve had quite an interesting adventure last year, both the original and the replacement (replacement being around the same age if not older) failing short. I’ve described this adventure on my site (Everex-286 and MFM harddrive) [ Blake here, linking to his post (Romanian) and via Google Translate to English. ] The power supply that is the same age as the rest of the computer (around 30 years) had all its electrolytics in good shape, good ESR slightly (maybe 10%) under capacity and it didn’t play any role in the failure of the tantalums because the -12v rail was linearly regulated (with a 7912). Indeed, it’s only the newer Amigas (that is, A600, A1200, A4000 and CD32) that use surface mount capacitors and are therefore under serious danger from leaking electrolyte. As already explained, the electrolyte leaks from these down beneath the part, slowly corroding the traces on the PCB underneath the capacitor while often remaining invisible to the naked eye. This is exacerbated by the fact that surface mount electrolytics were a relatively young technology a the time, and Commodore used the cheapest they could get. Older Amigas use the older through-hole capacitors, which by contrast are a more mature technology, and onthe rare occasion when they do leak, they leak through the pressure relief safety cap on the top of the part, far away from the delicate PCB traces. This is also the case with Ataris, Acorns and pretty much every 8-bit machine, which is why there’s far less noise around capacitors in those communities. The Amiga was perhaps the last mainstream “home computer”, and as a result, pretty much the only one to last into the age of surface mount technology. But if you look at the console communities, you’ll find the Sega Gamegear (designed and launched around the same time as the A600) has had similar issues with SMT capacitor failures. I would also suspect that many PC motherboards in the early SMT days suffered similar fates (this is different to the capacitor plague of the early ’00s), but they were all replaced long before it was an issue. I should add, that I have replaced the capacitors in dozens of the newer Amigas, and can only think of three cases where there *wasn’t* a sign of leakage. Many have had significant damage requiring many hours of sometimes ugly repairs and reconstruction of circuit pads and traces that simply no longer exist. People come to me with what’s perceived as a simple fault (“it loads games but the colours are funny”, “it works but the audio is crackly/only works on one speaker”, “it’s fine except the mouse doesn’t work”), expecting a simple recap to fix the issue, but instead finding that the entire video output stage has to be reconstructed with copper foil, wire, epoxy and many hours of labour. But even machines that show no symptoms can be on the brink – one Amiga 600 I recapped recently had a CF card installed as a hard drive containing lots of games, and was working just fine. but as soon as I touched the IDE cable, you could hear the pins of the IDE connector crunching and crackling beneath the cable, and a gentle pull resulted in most of the pins coming straight off. The video section (located beside the IDE port) was just about working but wouldn’t have lasted much longer, and required all the components (not just the capacitors) to be removed and cleaned up or replaced, as the corrosive electrolyte had seeped underneath the flat parts and was eating many of the traces beneath them. In contrast, while I have replaced the capacitors in many A500s, I had advised that it wasn’t necessary and the owner just wanted to do it for peace of mind. I’ve never come across a failed capacitor in Amigas (other than those which were fitted backwards in the CD32, but that’s a different story…), though I’ve repaired various other equipment that malfunctioned due to through-hole capacitors failing. In these cases, the PCB was never seriously damaged due to how these capacitors fail. I haven’t replaced the capacitors in any of my own A500s, A2000s or Atari machines, and probably won’t until they develop a fault. So my advice to you would be to have the capacitors replaced in all of your machines that use SMT capacitors, but just carry on as you are with the through-hole machines. Just one thing you should be aware of is that, even though the machine might use through-hole capacitors, if they are from the early SMT years (early ’90s), some of their parts may use SMT capacitors. Some A500s for example use floppy drives which contain SMT capacitors. I’ve had these come to me with failed floppy drives due to the capacitors leaking and damaging the PCB and have managed to repair the drive rather than replacing it, and the CDTV remote control has a SMT capacitor in it too that can leak. But these failures may largely go unconsidered – the floppy drive “just died” and was replaced, for example.